I’m Mad as Hell and I’m Not Going to Let You Sharpen My Knife Anymore! I’m a sucker for this kind of stuff. Whether it be getting my ears cleaned on a sidewalk in India or paying 25¢ to be slapped in the head as a blessing by a holy transvestite, I just can’t resist these things. So, while sitting at a cafe in San Cristobal, Mexico and noticing a man walking down the street with what appeared to be half of a bicycle with a stone grinding wheel attached to it, I knew I had to investigate. 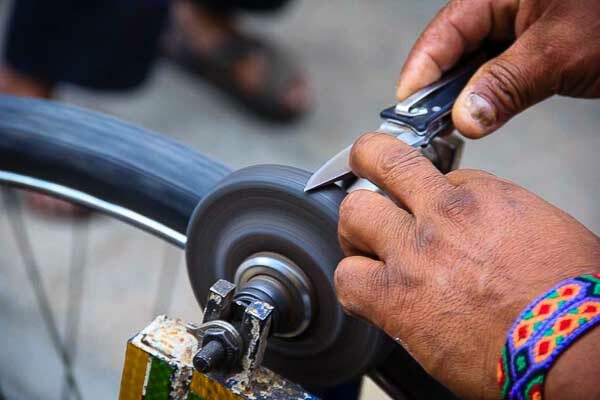 It turned out that he was a door-to-door knife sharpener and was passing by all the restaurants to sell his services. I had a cheap folding knife that I had bought in Bangkok’s Chinatown two years prior — it had cost me a whole $3 and was so dull it might cut a gummy bear if you got a good running start. I waved him over and found that he’d do it for a mere 50¢ — score! I wish I had a better photo of his rig but my camera battery died after just two shots, so this is all I have. He’d removed the front wheel and flipped the seat so that the rear tire spun in the air. It drove a small grinding wheel and he sat on the seat with one foot holding him up and the other driving the pedals. Sparks flew and he really worked the blade over pretty hard. And when he was done, it was –of course– duller than before. I am now afraid of being attacked by gummy bears. So now I’m in Léon, Nicaragua and am sharing a kitchen with several other people in a rented apartment. It’s been –literally– years since I’ve had access to a kitchen and I’m cooking like a fiend. Most of it is barely edible but I’m having fun and my veggie intake has quadrupled. Unfortunately the knives here are crap — the plastic handles fall off and they’re all so blunt they should feel lucky that Nicaraguans don’t eat gummy bears. So I’m using a new knife and it’s no longer a $3 flea market model. One of my best friends gave me a really nice Benchmade folding blade that cost about $100 and I’ve tuned it to perfection — I can flip it open one-handed and stab myself in the finger in a matter of seconds. After all of this use, it’s losing its edge so I’ve been looking for a small whetstone. All of the hardware shops only carry one that is the size of a brick and costs $12. (Yeah, I know it’s only $12 but that’s nearly 2 nights rent, to put it in perspective). And who wants to carry a brick around? Today, I stumble across another knife-sharpener working door-to-door. He has a different setup — a small red wooden bench with a large grinding wheel that he can work by a hand crank and has one of those brick-sized whetstones strapped to the bench. I just want a bit of a polish so I tell him not to use the grinding wheel but just the whetstone and to be tranquilo — go easy. He takes my knife, runs his thumb over the edge and starts just grinding it into the whetstone as hard as he can, as if he’s trying to carve the damned brick in half. “Tranquilo! Tranquilo,” I plead but he just looks at me like I’m an idiot. He’s the expert here, after all. He hasn’t bothered to add water or oil to the stone so gray dust is billowing up like I’m watching a moon landing. Finally, I stop him. “No mas, no mas…” He tries to fold the blade back as he hands it over but he’s worked it so hard that the screws have loosened and the blade is now out of alignment and won’t fold more than 45 degrees. I hand him his 50¢ and walk away. It takes me half an hour of tinkering to get the damned thing back together. While doing so, I notice that he’s actually knocked one of the Torx screws out and no matter how much I try, I can’t get it to swing open the way it did before. This means I have to flip it open with more force and am now more likely to stab myself in the toe than the finger. And it is –of course– duller than before. So that’s it. I’m done. Unless I get a free ear-cleaning or it’s done by a transvestite, I’m not letting anyone sharpen my knife again. Interesting story Johnny, well told. I too saw the “knife guys” (and the laces guy and the leather guy) strolling by random streets or busy markets in Mexico and all places south but never stopped long enough to use their service. Based on your story my knives (and machete) are glad I didn’t. I also appreciate your budget perspective. Cheers. Ha ha! You made me laugh a lot, reminded me of a sharpening story. My father, my brothers and myself LOVE to sharpen knives. My dad used to go hunting when teenager, so having a sharp knife to peel hogs, iguanas, deers, rabbits and the like while still warm was a must. So sharpening knives is a skill passed from father to son for a few generations now. Still, my mother found our best knife in the kitchen a bit dull when cutting tomatoes and one of those sharpening guys was yelling in the street (In México, they also use a toy xylophone to announce their “services”) so she called him. She was so ashamed later that she actually hid the knife until we started asking where was our favorite one. We were almost to tears! The knife went from a beautiful edge, to a saw. An actual saw, with more-or-less defined teeth and everything. The Moron that committed this crime lost 30% of the blade trying to get it sharp, rendering the blade almost useless. Almost, because we spent hours re-sharpening the knife which still sits useful in my parents kitchen. We’re so attached to our knives, that usually when I go back to México we (Dad, brother and me) visit the Ojeda Knives factory and store, where you can get about the best knives worldwide. From pocket knives to machetes, to whole dinner sets, they have it all. In our visit, we usually buy one more knife to our collection or as a gift, and bring our dull knives for them to sharpen them. The steel they use is so hard (and shiny! ), that manually sharpening is a pain. Want me to send you one? From a sharpener’s victim to another. I’ve got a small, portable waiting for me at home o I should be set soon. Thanks for the offer though! Next time you should pay the person to let you sharpen your knife on their machine. It only takes a little bit of practice to be somewhat decent at getting a good edge on a knife. You won’t be pro but you also won’t be looking for a screwdriver to put your curved knife back together =P. Yuppers, once again I laughed, I cried, I oohed and I ahhhed. “…I’ve tuned it to perfection — I can flip it open one-handed and stab myself in the finger in a matter of seconds.” I have wonderful visuals from this statement. We were quite pissed when security guards confiscated our huge and sharp cooking knife we bought from New Zealand in Alicante railway station in Spain. Guess that was after all a blessing if getting knives sharpened is such a pain. However carrying an extra whetstone would be a nice beginning for a portable stone collection. Think about how cool it would be to have a portable stone collection in the backpack! It’s the little side stories like these that make world travel all the more special. I think the knife sharpeners are more of a Central American oddity. In South America, it’s all about the shoe polishers. The locals love to have another fellow on his knees cleaning their shoes. It gave me an ego boost hey. I once found a switchblade on the ground in the middle of the night in the middle of a city. Being on my way home from the bar, I figured it was a great idea to pick it up and take it home. Oh yes, after I wiped some blood off of it (?!?). I’m sure it is the missing puzzle piece to a murder investigation, but you’re welcome to help yourself to it if you need another knife. I wish I was making this story up. The year and the city shall remain nameless. I once found a switchblade on the ground in the middle of the night in the middle of a city. (The year and the city shall remain nameless.) Being on my way home from the bar, I figured it was a great idea to pick it up and take it home. Oh yes, after I wiped some blood off of it (?!?). I’m sure it is the missing puzzle piece to a murder investigation, but you’re welcome to help yourself to it if you need another knife. I guess it’s like those really cheap (or free) street massages, which I’ve experienced across the globe. In the end, I’d rather pay a few extra bucks so I feel like I’m not wasting my time, or worse, handing my body over to a pervert who is trying to convince me that my friends and I are sailors who are visiting his seaside community. I wondered about those guys in San Cristobal. Well at least now you have two things you can use as rocks to throw at Gummy Bears. Interesting Story.. Great to see you could eat atleast! I have a really hard time letting people do those small jobs that I really don’t want in the first place. You might try keeping two knives. One for them to screw up and one for you to take care of yourself. Or you could just rent the whetstone from the guy for a few minutes. I agree with the last commenter – maybe rent the whetstone next time…or you could spend your evenings lining up gummy bears and threatening them insidiously with your newly dull knife the next time you are feeling stressed. Isabella Rose recently posted..History & Truth: Is It Time To Start Questioning? Oh, man, that is a total bummer. What the heck was that dude thinking putting so much pressure on the blade. I’ve seen some of the door-to-door-kind-of-sharpeners do a pretty good job sometimes. I guess it’s hard to tell who you can actually trust. Haha! Nice encounter you had. For me I would rather get slap by a holy transvestite then paying some street ‘expert’ to polish my knife. Something is best to do it yourself. I mean with just some practice you will be able to do it well. Cheers! Well, it’s a shame that the knife was a complete loss, but the fact that you had a pocket knife make it from Thailand to Mexico is an amazing accomplishment in itself. I can’t get a bottle opener from Thailand to hold up for a day, let alone a pocket knife. Scott recently posted..Mini Multi Tool: Are They Worth it?